Tomorrow is the last day for you to shop for the products available in the latest Target Ad Preview 5th April. Until 11th April these prices are effective. Easy and efficient browse is possible for every customer of Target. With using this Target Ad you are able to reach top quality electronics as well. For your office and home works you can find printers, scanners or compact devices. Simple works of cleaning are easier now. For example you can find new vacuum cleaners in this Target Weekly ad. Target's April range of second week also covers some baby products. Check last page of the ad to view these products. On the first section of the Target Ad we are observing new prices of beauty and health products mainly for ladies. If you visit pg; 2 you will be able to see more details. New vacuum cleaner of Target on this ad is Dyson Cinetic Big Ball vacuum. But it is not the only one. Find also more practical and ligher product of Bisell on the same page. Its technology allows you to reach challenging places with easy way. Target is up with its latest ad containing the best products of gifts featured on this ad. 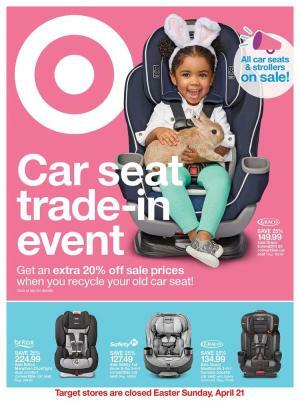 Target Easter gifts are chocolates, toys, furniture, women's clothing in summer, electronics and decor with amazing savings with no harm to your budget. You can follow Target Ad on the category on the main page. 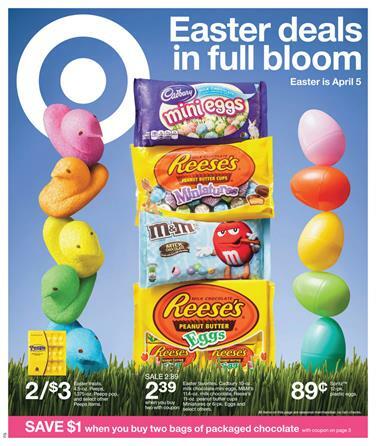 Target Easter Sale of chocolates on cover page with their attractiveness are easy to find. 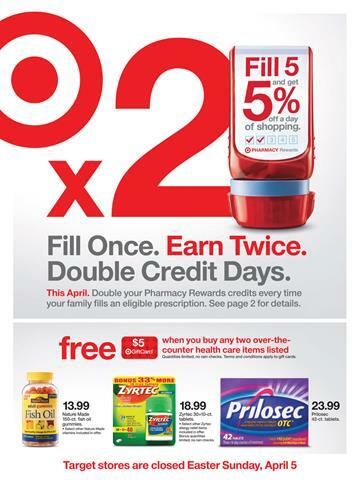 Visit Target Ad preview of April first week. You can save big amounts. Also see Easter baskets on pg; 2 that contains a pretty nice range of it. Check out details about Easter baskets full of plastic, bamboo and similar varieties. Brilliant selection of toys from Target Stores are featured on this week. Take a look at them on pg; 6-7 with 50% off. More than these are available on the latest Target Ad. Don't miss out any of the deals this week. A very fine selection by Target Ad March home sale and entertainment are available. Recently published catalogue is viewed on preview page of the latest Target Ad. Target weekly ad offers might be great help for you to reach best prices of home products like bedroom products, outdoor furniture, home appliances like vacuum cleaners, kitchenware, clothing and indoor home electrical entertainments. Summer entertainment products for kids are also featured on new Target Catalogue. Target stores sell perfect product list for this week. An amazing product sale is available. Target sells these products for optimum price level. You don't have to spend a fortune on this shopping. Target kitchenware deals featuring kitchen appliances for making your preparation much more easier. To deal with the prices please take a look at new Target ad. Target weekly ad kitchenware is a modern, good looking and popular product sale. And many more for your kitchen are featured on new Target weekly ad. Please view full ad before ending up with a choice. Target ad Summer products are featuring real quality swimwear products. 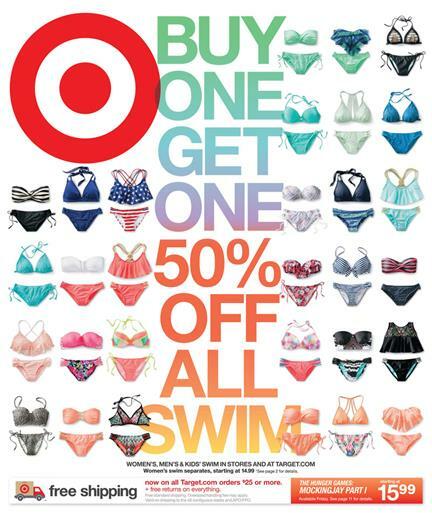 50% off by Target for all swimwear for this Spring-Summer season. There is a new nice sale for kids as well. Kids clothing swimwear deals are easy to find on this ad. Target ad offers half prices for all of them. Please go to pg; 2-3. For men's swim again half prices are valid. Women's outfits for this summer are new sale of March first week. Target ad products for ladies are offered with 50% discount again. Similar sort of products can be found on the official page of the preview of the newest Target ad. These cannot be seen on the preview on our page because they are linked to another page within the map of official site of Target. All Xhilaration apparels, buy 1 get 1 half price. If you need suitable prices for a notebook to handle daily works in your office or working room you would be on the correct place once you visit pg; 8 of the Target Ad published. Acer aspire computer featuring intel celeron CPU is only $199.99 at Target stores. VIZIO 55" Class LED Smart TV $649.99 pg; 11. Kitchen Appliances are offered with 20% OFF this week. And dozens of more Target electronic products are featured by the latest Target Ad. You will be saving a lot amount of your budget while you are shopping for the descent and luxury needs of your house. You might find household needs, personal care items and cleaning supplies on Target ad published in the March 2015 first week. Target Ad preview 2/22 home products featuring new prices make you accept it as an entertainment and you don't even need any of these products from the ad. It is a great product range to browse ! Target Weekly Ad February sales are generally focused on the home products, electrical appliances, and home entertainments. We love really good deals from Target. To discover more of good deals please go to preview page and see new products. Many of electronic offers are featured on new Target ad. See pg; 12-13 for camera, TV offers, and game consoles. Vacuum cleaners, cook ware and kitchen electrical appliances, and more products also account this section of Target Weekly Ad. * Nikon Digital Camera 16 MP 30X optical zoom $159.99 ! Also see Samsung LED Tv and some of the video games that are real fun with these full HD monitors. Amazing products of electronic section of Target Ad can be viewed on these pages. 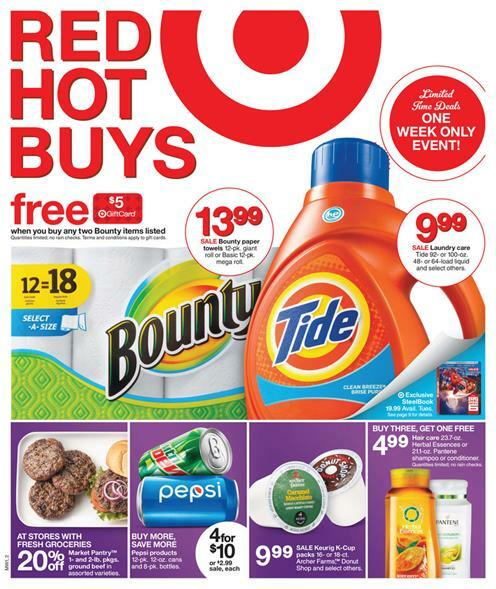 Household needs, home wares, essentials for kitchen and many more items of Target Weekly ad 2/22 preview are a good illumination for saving more. 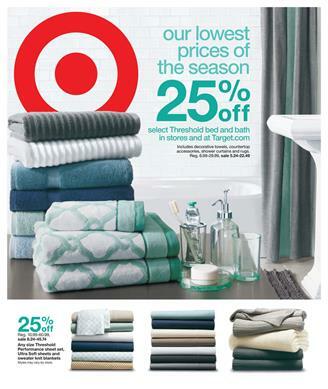 To save more, shop for better quality and stay awake about the deals follow Target Weekly Ad on main page of it.